9-1-1 is the universal emergency number that you can use 24 hours a day from anywhere to contact the police, fire or emergency medical services. This number will connect you to the Burlington County Central Communications Center in Westhampton. 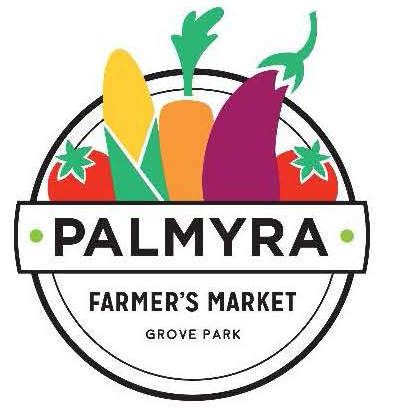 This is the answering point for all Palmyra 9-1-1 calls. 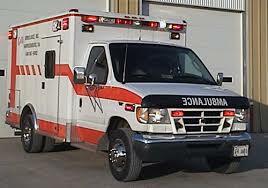 9-1-1 should however ONLY be used whenever there is immediate danger to life or property. It should be called to report fires, crimes in progress and medical emergencies. • IDENTIFY YOUR HOME: Is your house number posted on your house? Can it be seen in the day and night? • Are any of the numbers covered by shrubs or trees? • If you live in multiple buildings: is each building marked and apartment? One of the best features about 9-1-1 is that when you can call, even if you have to exit from where you are right away, whether you hang up the phone right away or leave it off the hook, 9-1-1 operators will know where the call comes from and dispatch the appropriate services. One a fire starts, flames spread very rapidly. In most cases, the amount of time you have to escape is no more than 3 to 10 minutes, and even less if the fire started before you become aware of it. 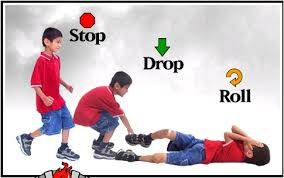 In a fire emergency, you have to know how to get out fast and stay out. That’s why you need to practice E.D.I.T.H – Exit Drills In TheHome. MORE THAN HALF OF ALL FATAL FIRES HAPPEN WHILE PEOPLE ARE SLEEPING! Once the fire has started, there’s no time to plan how to get out. Sit down with the whole family and make a step-by-step plan for escaping a fire. Draw a diagram of your house indicating two ways out of every room. Be sure that each family member knows the two ways out! Practice at least twice a year. Make sure everyone in the house can unlock all doors and windows quickly, even in the dark. Check doors with the back of your hand not the palm side. In case the door is warm or hot Do Not Use It! Go to your second way out, the window. If the doors feels cool, use caution when opening it. YOU MUST HAVE SMOKE DETECTORS AND THEY MUST WORK. Also everyone must be able to hear them. Studies have shown that some children may not awaken to the sound of a smoke alarm even when it was in their own room! Establish one specific location for all the family to gather, preferably in front, where the fire trucks will be. Use a tree or a fire hydrant, something permanent where you can meet. This allows you to count heads and inform the police or fire department if anyone is missing or trapped inside the house. Each family member should know how to call 9-1-1. Once everyone is out of the house, they must NOT go back inside for any reason. If people are trapped inside, firefighters, not family members, have the best chance of rescuing them. Do not try to rescue possessions or pets. Go directly to your meeting place, and then call the fire department from outside or from a neighbor’s house. If you must escape from an upper story window, be sure there is a safe way to reach the ground, such as a fire escape ladder. 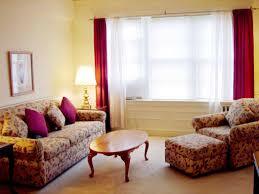 Make special arrangements for children, older adults, and people with disabilities. Always use the stairs and not elevators they may stop in between floors or take you to a floor where the fire is burning. Close all doors between you and the fire. Stuff the cracks around the doors to keep out smoke. Wait at a window and signal for help with a flashlight or by waving a cloth. Crawl Low in smoke keeping your head 12 to 24 inches above the floor, where the air is cleaner. Smoke contains deadly gases, and heat rises. Cleaner air will be near the floor. If you encounter smoke using your primary exit, use your alternate escape plan. No one expects a fire to strike, yet every year 600,000 house fires occur. House fires kill about 5,000 people annually, injure about 25,000 and cause more than 10 billion in property damage. Prevent fires before they start! Use this guide to do a room-by-room search for fire hazards in your home. over 350 people each year. • Install smoke detectors on every level of the home -as a minimum. They should be installed within 10 feet of each sleeping area. Don’t place a detector in the kitchen although that seems to make sense it will activate causing false alarms. 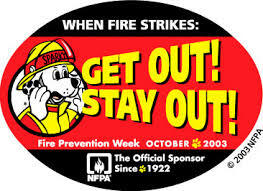 • Test smoke detectors monthly and change the batteries once a year. If you hear a “chripping” sound the detectors has a low battery and needs to changed. Many people think they are protected but if the battery is dead so is the detector. A detector with a dead battery is the same as having no detector at all. • Never paint a smoke detector. • Put out cigarettes in an ashtray. Never throw them in the trash. Make sure they are completely out. • Keep all lighters and matches in locked or high cabinets away from children. Make children aware that matches and lighters are not toys for kids, they are tools for adults. • Use light bulbs with the correct wattage for the fixture. • Electrical fires are caused by sparks, faulty appliances, and overheated wiring. Replace all frayed, cracked or broken electrical cords. Always plug major appliances directly into outlets. • Use outlets safely. Don’t plug too many large appliances into one outlet, overload an extension cord, or plug more than one extension cord into an outlet. • Keep the stovetop and oven clean to avoid grease fires. Keep a fire extinguisher near by. NEVER put water on a cooking fire. If a pan of food catches fire, carefully slide a lid over the pan and turn off your stove burner. If the fire starts in the oven, close the door and turn off the oven. Call the fire department. • NEVER leave cooking unattended. • Keep your stove and oven clean. • Don’t cook if your sleepy or if you’ve been drinking alcohol. • Watch what you put on the stove. An electrical coil reaches a temperature of 800 degrees. A gas flame reaches over 1000 degrees. Your dish towel can catch fire at 400 degrees. So can your bathrobe, apron and loose clothing. • Remove towels, potholders, plastic bags, newspaper and other flammable materials around the stovetop. • Do not hang curtains or other flammable materials above or around the stove. • Replace or have a professional fix any appliance with frayed or loose cords or wires, or cords that get hot while the appliance is in use. • Do not use or store appliances and cords near water where they can get wet. • Also watch toasters. They get very hot! Hang paper towel racks, curtains and towels away from they toaster. • Turn pot handles toward the back of the stovetop. • Use only microwave safe dishes in the microwave. • Wear tight-fitting sleeves or roll them up when cooking. • Unplug appliances when not in use. • If someone should get burned, quickly place the wound in cool water until the burning process stops (about 10 to 15 minutes) this will minimize skin damage and ease the pain. • If the burn is more than a first degree (redness) and it blisters or chars, call 9-1-1 immediately to seek the proper medical attention. If the area of the body is greater than 10% on an adult or if a child is burned, go to the nearest hospital or call 9-1-1. • Your hot water thermostat on your hot water heater should be set to a maximum of 120 degrees. • Never use ice (unless very minor), butter, petroleum jelly, vitamin E or any medicated ointment on a burn. Do not break blisters. Don’t remove pieces of clothing that are stuck to the burn site. Everyone of all ages should know this rule. If your clothes catch fire, don’t run! Stop where you are, drop to the ground, cover your face with your hands to protect your face and lungs. Roll over and over back and forth to smother the flames. Living Room: Heating appliances kill over 450 people each year. • Avoid running cords or wires under rugs and carpets or near a heat source where they can overheat. Don’t run them across doorways where they can become worn. • Do you have an older houses: Watch for electrical problems: Dimming lights when appliances goes on, a shrinking TV picture, slow heating appliances (like a toaster), Fuses blowing frequently, a smoking appliance, any usual smells. • Stack newspapers, wood, matches and other items that might catch fire away from fireplace or wood stoves. Only burn materials appropriate for the fireplace, never burn trash or paper. Have a chimney cap installed to prevent animals from getting in. Always use fireplace screens. Always use a metal container to remove ashes and never store them in your home. • Space heaters need space! They should have at least 3 feet away from furniture, clothing, walls and other things that can burn. • Always turn the heater off when sleeping. • Never leave the heater on unattended. • Avoid using extension cords. • Install approved stove board under wood burning stoves. The non-combustible floor protector should extend 18 inches beyond the stove on all sides. Stoves should be placed at least 3 feet away from any wall. 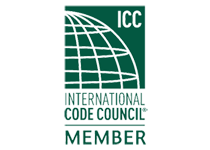 Follow manufacturers recommendations. Keep pets away from these appliances also. • Kerosene heaters should not be used indoors. • Run appliance cords away from sink or tub where they can get wet. • Install Ground Fault Circuit Interrupters (GFCI’s) in the bathroom, kitchen, and other rooms with water or moisture. These shut off the electrical current when there is a danger of shock. • Use hair dryers and curling irons away from items that might burn. Disconnect after use. Don’t fold or crimp cords when storing. • Install a smoke detector in the hallway and in each bedroom. Sleep with the door closed. • NEVER smoke in bed. • Use a heating pad or heating blanket for no more than 30 minutes. Unplug when finished. • Have your furnace checked before each heating season to be sure it is in proper working condition. • Change furnace filters frequently. 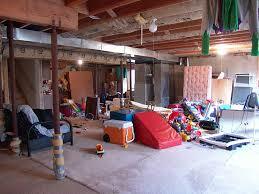 • If you use the basement as a bedroom, make sure windows are large enough to crawl through in case of fire. • Do not store trash and anything that could catch fire near the furnace. • Become familiar with your main electric panel. Check wiring and fuses. • Clean lint from dryer screen before each use. Plug dryer into a separate outlet and vent it to the outside. Keep the area clean. Plug washers and dryers into their own outlets. • Follows manufacturers’ recommended time for drying synthetic fabrics, rubber, plastics or foam. • Use proper gauge extension cord with any power tool or high-wattage equipment. • Store gasoline in approved, tightly sealed containers and use only as a motor fuel. • Keep paints and other flammable liquids and chemicals in their original, labeled containers with tight-fitting lids. • Use and store flammables (e.g. pesticides, fertilizers, paint, gasoline) away from any source of heat or flame. Never smoke near flammable liquids. 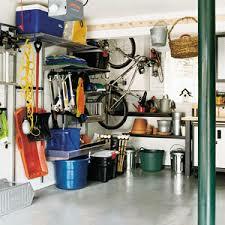 • If your garage is attached to the house, is it separated by a tight fitting door which is kept closed? • Dispose of oil-soaked rags after use or store in a tightly-closed metal container. Never burn them or throw them in the trash that will be burned.Place unused charcoal in a metal container with a tight-fitting lid in a cool, dry place. Damp charcoal can ignite itself. • Have a All-Purpose Fire Extinguisher accessible and know how to use it. Carbon Monoxide (CO) is , an invisible, odorless gas that comes from burning fossil fuels such as gasoline, wood, coal, propane, oil and methane. When these fuels burn incompletely, CO is produced. Home heating and cooking appliances can produce CO if damaged or misused. Vehicles such as cars, trucks, tractors and lawn mowers are also a source of CO. Any motor allowed to run indoors (garages) can produce dangerous levels of CO.
CO is inhaled and is absorbed by hemoglobin, the oxygen carrying protein in the blood. CO replaces the oxygen in the blood and eventually causes suffocation due to the lack of oxygen in the blood. 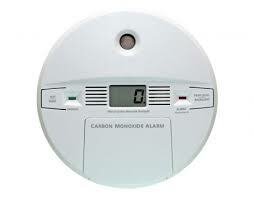 Carbon Monoxide replaces the oxygen that is in our bloodstream; this can lead to suffocation. Flu-like symptoms are an early indication of mild CO poisoning. More serious exposure can lead to difficulty breathing and eventually death. Those most at risk for poisoning are the very young (4 years or younger) and the very old (75 and older). While everyone is at risk for CO poisoning, unborn babies, infants and young children, senior citizens and people with heart and lung problems are at a high risk due to their greater oxygen needs. 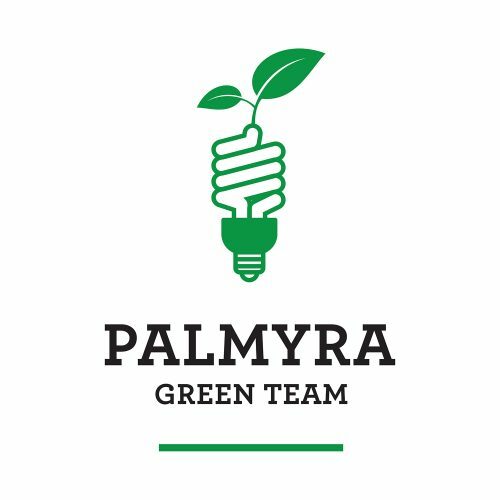 Safe use and proper installation of household appliances that burn fossil fuels, as well as, proper use of vehicles, especially in attached garages, is the best protection you can provide for your family. CO detectors can add a level of protection, but are not a substitute for safe use of equipment. Have all heating equipment inspected and serviced each year and know the proper use and maintenance of household cooking equipment. • Do not run motors indoors; even if garage doors are open. • Have your vehicles inspected fro exhaust leaks. • Inspect and repair chimneys, fireplaces, wood stoves, etc. each year before cold weather sets in. • Be sure your heating equipment has an adequate supply of fresh air for combustion. 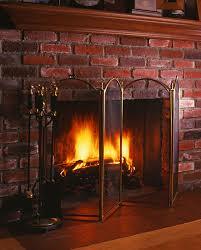 • Open the flu when using the fireplace to insure adequate ventilation. • Gas barbecue grills can produce CO. Never use them indoors or in the garage; even if the garage doors are open. • On a gas stove look for a blue flame. If you see yellow or orange in the flame that is a sign of incomplete burning call a qualified repair person. What Should I do if my CO Detector Alarm Goes Off? • Make sure no on is experiencing any signs of CO poisoning. 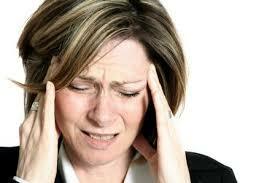 Severe headache, drowsiness, confusion and a fast heart rate. Prolonged exposure to medium levels of CO can result in death. Loss of consciousness, convulsions, heart and lung failure, possible brain damage and death. If symptoms of CO poisoning are present, every one should exit the building leaving the doors open as you go. • Use a neighbor’s telephone to report the alarm and follow the instructions you are given. • If symptoms of CO poisoning are not present, open windows and doors, shut down heating and cooking equipment. • Call the Fire Department to check CO levels in the home. What Kind of Detector Do I get? • There are battery operated and plug-in (electrical) units. • Look for a manual reset button and test button. • A alarm that sounds at least at 85 decibels. • Approval from a testing laboratory such as Underwriters Laboratory. • For all CO detectors, a continuous siren signals a full alarm, a repetition of loud pulsating beeps means there is a CO build-up; and a short “chirp” every minute alerts you to a malfunction or low battery. 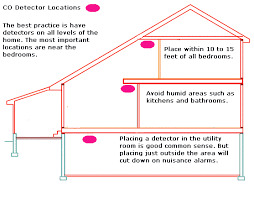 Install CO Detectors near bedroom areas and family rooms. Do not install them near air vents or fans. Place them in the center of the room where they can measure the overall atmosphere. Although the New Jersey State Division of Fire Safety recommends that they be placed in the hallway outside all sleeping areas. 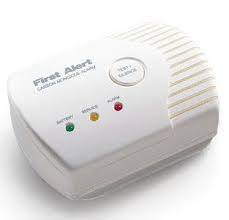 To avoid nuisance alarms do not put a CO detector in the kitchen, garage, utility room, basement, bathroom or unventilated rooms where cleaning supplies are kept. Chemical fumes, humidity and very hot or cold temperatures will affect the performance of a detector.